These bad boys are fingerless mittens with optional mitten flap. 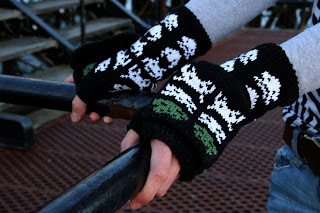 The space invaders pattern was grafted from Aija Goto's excellent bmp space invader sock pattern from Knitty. Pic by the talented Mr Harvey.